In an ideal world, our work lives would be completely fulfilling and intrinsically motivating. But what if you're stuck in a job and your heart isn't in it anymore? Or what if your company's mission seems unrelated to the work you do day in and day out? 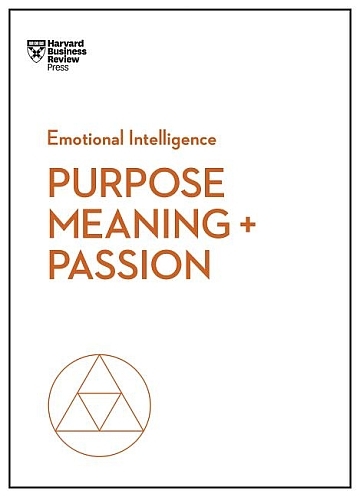 This book showcases the power of passion--and how you and your team can find it at work. This volume includes the work of: Morten Hansen, Teresa Amabile, Scott A. Snook, and Nick Craig. How to be human at work. HBR's Emotional Intelligence Series features smart, essential reading on the human side of professional life from the pages of "Harvard Business Review." Each book in the series offers proven research showing how our emotions impact our work lives, practical advice for managing difficult people and situations, and inspiring essays on what it means to tend to our emotional well-being at work. Uplifting and practical, these books describe the social skills that are critical for ambitious professionals to master. This collection of articles includes "Finding Meaning at Work, Even When Your Job Is Dull," by Morten Hansen and Dacher Keltner; "What to Do When Your Heart Isn't in Your Work Anymore," by Andy Molinsky; "You Don't Find Your Purpose--You Build It," by John Coleman; "How to Find Meaning in a Job That Isn't Your True Calling," by Emily Esfahani Smith; "You're Never Done Finding Purpose at Work," by Dan Pontefract; "From Purpose to Impact," by Nick Craig and Scott A. Snook; "Five Questions to Help Your Employees Find Their Inner Purpose," by Kristi Hedges; "How to Make Work More Meaningful for Your Team," by Lewis Garrad and Tomas Chamorro-Premuzic; "The Power of Small Wins," by Teresa M. Amabile and Steven J. Kramer; and "The Founder of TOMS on Reimagining the Company's Mission," by Blake Mycoskie.